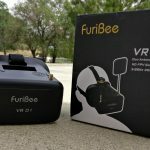 If you are interested in picking these goggles up, we recommend purchasing from GearBest. They can be found here. Not only did they sponsor our site by providing us with a review copy, we have always been a fan of their great prices and rapid, cheap shipping – despite being located all the way in China! 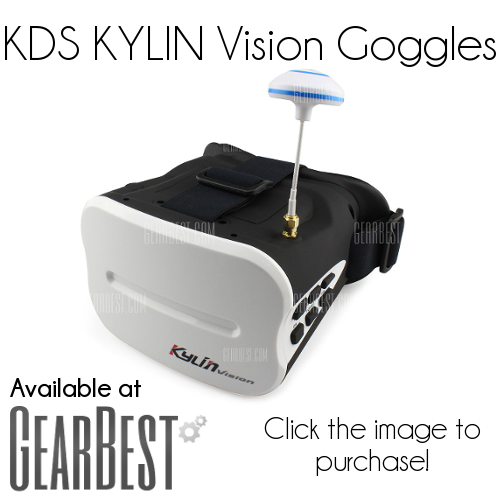 The KDS Kylin goggles come neatly packaged in a small box with a single cell LiPo battery for power and a cheap right circularly polarized (RCP) 5.8GHz antenna. It’s nice to see manufacturers shipping their goggles with mushroom antennae instead of the useless rubber duckies that have until now been the standard. That being said, I think I recognize this antenna from performance tests done by Bruce at RCModelReviews and it didn’t do too well. Still – this works much better than the linear duckies. 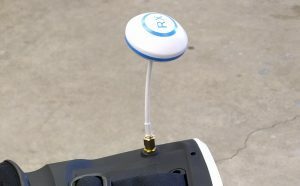 The stock antenna is RCP but not of great quality. I was immediately impressed by the build quality of the KDS Kylin goggles. The other two fresnel lens-based goggles I have experience with are the Quanum DIY goggles and the HeadPlay HDs. 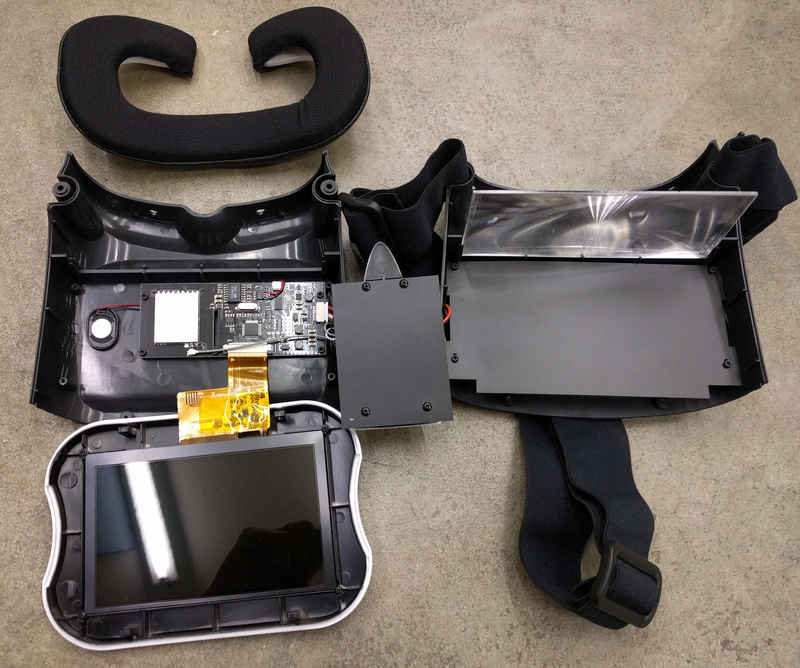 Those goggles are both built using foam enclosures that encases a 5.8GHz video receiver, a video monitor, and a special lens which expands the viewing angle of the monitor. The KDS Kylin goggles deviates from the “cheap” foam design by having a fully plastic enclosure. I never thought I’d be complimenting the “build quality” of a plastic enclosure – but it certainly feels more “professional” than foam bodies. 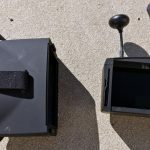 The faceplate of the KDS Kylin goggles was quite a disappointment to me. I just could not get it to fit comfortably over my face. The reason is the nose slot is not deep enough for my nose. When I put the goggles on, all of the pressure is seated right on the bridge of my nose and the bottom part of the faceplate does not seal properly against the rest of my face. This is both uncomfortable and lets external light in, which reduces the quality of the image. It is worth mentioning that this faceplate would undoubtedly be fine for many people- just not those with longer noses like myself. Something to keep in mind when purchasing the product depending on your facial structure! The nose slot for the faceplate is not deep enough for my nose, resulting in an uncomfortable headset and light leakage. I ultimately ended up adding some extra padding from some motorcycle goggles onto the Kylin headset to fix this issue. I also believe you could cut the nose slot deeper if you don’t mind defacing your goggles. As always, there are many DIY solutions to everything in this hobby! Again, for most people this shouldn’t be an issue, however if it is, I highly recommend padding the nose plate to make the goggles more comfortable. The Kylin headset has a removeable LiPo battery built into the top. I was very pleased to find that the KDS Kylin headset had an integrated battery. This is a huge boon over the likes of Fat Sharks, Quantums, Headplays, etc for a couple of reasons. Perhaps most importantly, it allows the headset to have built in voltage monitoring that warns you when the battery gets too low. You will never be flying with this headset only to crash when the headset battery dies. It also means you can easily charge the battery by simply plugging it in like any other consumer electronics device in your life. In the case of the Kylin headset, that is done by plugging it into a USB port like most of us have in our cars these days. Nifty. Finally – an integrated battery quite frankly looks better. 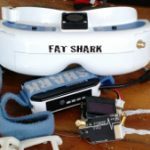 I was never a fan of having a battery hanging off of the side of my face – I can’t believe that is still the norm for the $500+ Fat Shark goggles. The downside of the battery is that it is relatively small. Whereas I generally get two hours of battery life on my Fat Sharks, and one hour on most other headsets, the KDS Kylin goggles start showing a red battery indicator at half an hour. This means you have to charge them pretty much every time you fly. Again – the fact that you can charge them with a USB cable goes a long way to making this acceptable in my eyes. You could even bring a power pack to the field to charge these while flying – something that would be much more different with the standard external batteries. With the battery charged, I loaded the KDS Kylin headset into my gear bag and headed to my local flying spot. After powering up my quad, I donned the headset and was greeted with static. Not too much of a shock though, as I hadn’t tuned the channel yet! 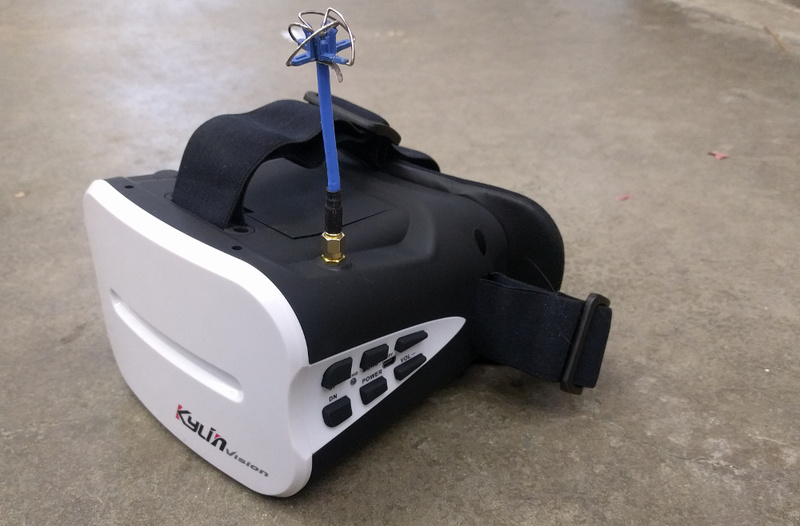 This proved to be easy – the KDS Kylin headset has an autotune feature that automatically searches the 5.8GHz band for a signal and locks on. Speaking of channels, it only supports channels in increments of .005GHz from 5.645 to 5.945GHz. This means it does not support many of the channels used by Race Band and the Boscam bands – it’ll pick up a video feed but the color will be off and range will be reduced. Knowing that, I tuned my quad to Raceband 2 (5.695GHz) and the headset picked it up in less than 5 seconds using the autotune. The picture quality was crisp and clear – about the same as I am used to with the Quanum headset I’ve tried in the past. The fresnel lens used in the Kylin KDS is not as wide or immersive as the lens used on the Headplay HD. 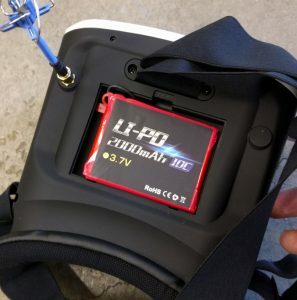 This is a blessing in disguise for drone racing, as I have always felt that the field of view on the Headplays is too wide for racing. Reason being, you will inevitably be using your peripheral vision way more often than you would like when flying with the Headplays. This can lead to a slower response time when making turns, rapidly approaching obstacles, or making tight turns. It is better to have the entire picture in your field of view like with the KDS Kylin or Quanum goggles. I had no problem flying under small obstacles or doing acro maneuvers over trees with these goggles. 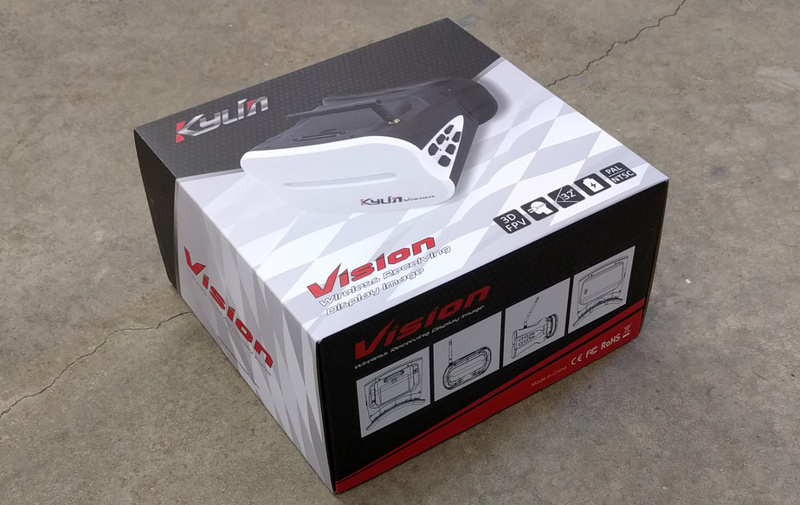 The video range of the KDS Kylin goggles is comparable to any other headset I have tried. This isn’t surprising, as the Kylin headset uses the same RX5808 video receiver chip that pretty much everyone else in the FPV market is using. That means that, assuming their PCB design is electrically sound, it should have the same range as everything else. The KDS Kylin goggles don’t have any way to attach an external video source. This means if you want to eventually fly with an HD video system like the Connex ProSight, these goggles are not for you. It also means that you won’t be able to easily jack into a ground station for long range flying or for better reception at racing events. For those of you who are electrically inclined, you should be able to add an analog tap by adding a switch onto the video signal coming out of the RX5808 chip in the goggles. However, since we are mainly looking at this set of goggles for entry level flyers, this is likely a non-issue. I couldn’t resist the chance to disassemble to the KDS Kylin headset to see how the whole system worked. This is a good exercise to see how well these goggles were designed, as well as to figure out what, if anything, is replaceable. What you see here is the real working guts of the headset. 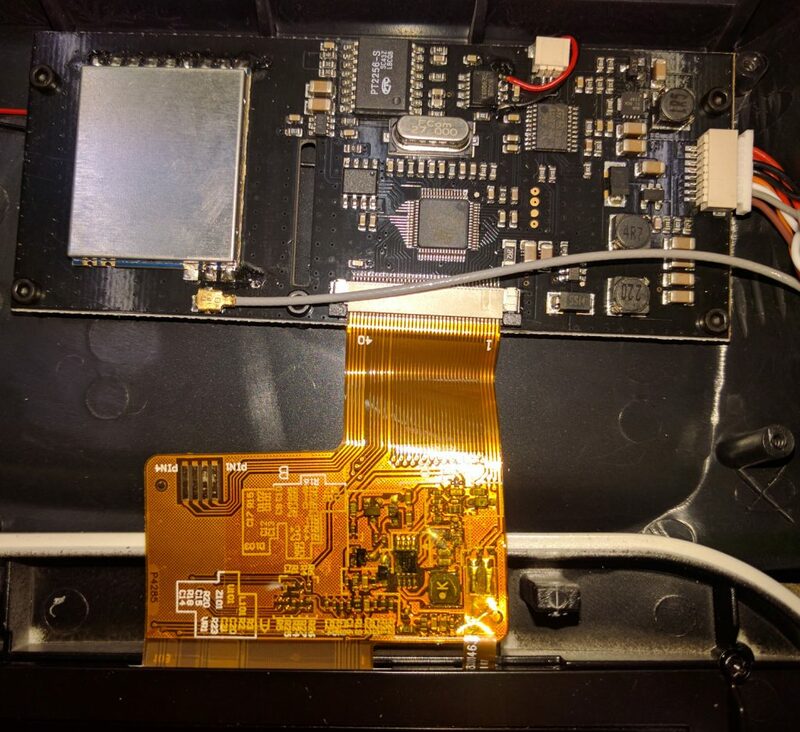 On the left is the RX5808 receiver chip that is used in all of the best 5.8GHz video receivers like the LaForge module. On the right is a small system on a chip that drives the LCD and responds to button presses from the button panel. All told, I thought this was a great design that will likely last for many years. The only thing that is likely to ever fail is the battery, which is replaceable. All told this is a fantastic FPV headset for the price. I genuinely believe that this is the headset to get if you are totally new to the hobby and don’t know if it is something you want to invest a lot of money into. 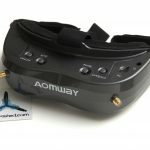 Between this, the FlySky i6 and the Lisam 210 budget build we are doing, you can easily have a competitive FPV racer for under $350. That’s fantastic considering just a year ago, the lower limit of entry to the hobby was closer to $600. Fantastic deal for under $100. Integrated, removeable battery that is rechargeable via USB. Easy to take apart and components are easy to access. Facial fit can be poor for some – uncomfortable and allows light leakage. We recommend undertaking a DIY fix if you encounter this. No HDMI or external video ports means you will be limited to the RX on the headset. Many FPV channels are not supported, including most of race band. Again, we want to thank the team over at Gearbest for providing us with these goggles for review. Definitely check it out over at Gearbest by clicking this link.